A dash of emu oil with scent a scent of lemon myrtle wafted around the treatment room as my pedicure came to a stylish conclusion at Margaret Dabbs new clinic in Cheltenham. Australian Emu oil is one of the signature ingredients used in many of the bespoke foot and nail products in the clinic as it contains natural anti-inflammatory healing properties and range of omega oils which promote good health. And this is exactly the ethos of this clinic. Margaret Dabbs, a trained podiatrist who is the pioneer behind the medical pedicure – a perfect fusion of health and beauty. This was evident when I experienced a manicure and pedicure. Yes, the final result was groomed and glossy nails in the colour of my choice but the therapists made it their primary job to ensure the health and wellbeing of all my nails came first. My treatment took place in a light, airy room and as I sat in a comfortable, white chair my podiatrist (ironically from Australia) started a complete overhaul of my feet. It started with the safe surgical removal of dead and dry skin followed by close attention to detail of my nails which were shaped, buffed and hydrated with Margaret Dabbs’ own range of products. After 45 minutes of pampering with purpose I felt like I was walking on air as I made my way into a separate area for my manicure. Once settled into my chair with feet up the nail technician repeating her careful health checks on my finger nails using a unique formula of emu oil mixed with tea tree oil to help keep nail infections at bay and strengthen the cuticles. She filed my nails with the magic crystal nail file before applying the varnish. I was good-to-go but the best feeling was the knowledge that after the polish had worn off I had natural healthy, well-shaped nails to show off. This is a great concept and I know I will be back. 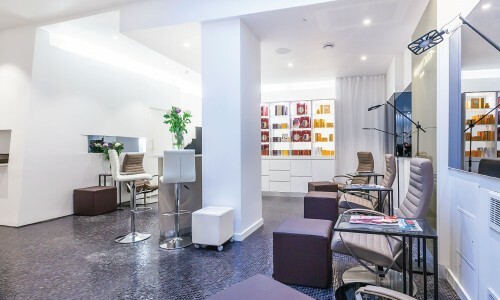 Margaret Dabbs now has clinics in Liberty, London Alderley Edge and in Dubai.